Use our easy-to-follow guide to making your own cake stand. No tea party is complete without a cake stand in the centre of the table brimming with cakes, biscuits and other delights. Whilst there are many beautiful cake stands to be bought, these ones can be made at a fraction of the cost and couldn’t be easier to put together. All you need to do is choose some pretty china plates and teacups, which can easily be found at vintage markets, fairs or charity shops. Mixing and matching patterns and designs looks great and eclectic, whilst choosing the same colours and designs looks equally pretty and sophisticated. Take the largest plate and glue one of the teacups to the centre of the plate, which way round the teacup goes is completely up to you. 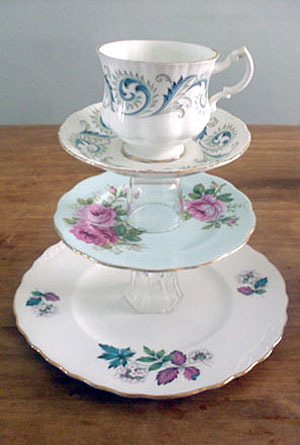 Then glue the medium sized plate to the teacup. Then glue the second teacup to the centre of the medium sized plate and glue the smallest plate to this. 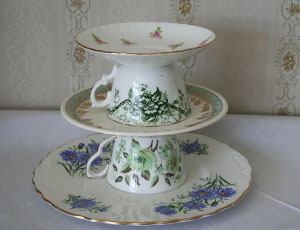 You can always add one final teacup or eggcup to the top of the smallest plate which could hold chocolates or finger biscuits.